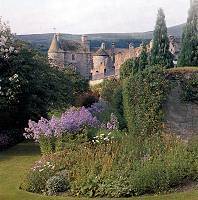 The Royal Palace of Falkland, set in the heart of a unique medieval village, was the country residence and hunting lodge of eight Stuart monarchs, including Mary Queen of Scots. Built between 1501 and 1541, the palace is an extremely fine example of Renaissance architecture. It includes the exceptionally beautiful Chapel Royal, and is surrounded by internationally renowned gardens, built in the 1950's. The Royal Tennis Court, reputedly the world's oldest, is still in use today. A912, 11 miles north of Kirkcaldy, 10 miles from M90, junction 8.